With vast terrain of natural habitat and great wildlife Botswana stands out as the ultimate safari destination in Africa. Botswana offers a wide range of safaris. You can undertake some of the safaris by yourself while for others you will require the support of professional guides. Even though safari tours in Botswana can be all year round, there best holidays that will enable you to enjoy your safari optimally when in Botswana. The dry Botswana winter: between May and October. The period offers you the best game viewing as wildlife gathers around water sources. The rainy Botswana summer: between November and April. The period offers excellent bird watching and tour operators offer special tour packages. Considering that 17% of land in Botswana has been dedicated to game preservation, you require fully serviced and to a lesser extent customized vehicles to reach your choice spots. Some of the tour operators offer tour vehicles which come fitted with aiding devices like GPS and self-inflating tyre systems. 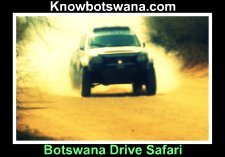 Botswana 4x4 safari: all of Botswana terrain in game reserves and parks requires the use of 4x4 vehicles. 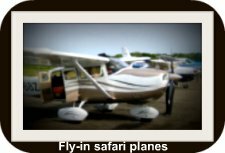 Botswana fly-in safari: a light aircraft chattered from small aircraft operators will serve you well in areas like the Okavango Delta which have small landing airstrips. Botswana quad bike safari: the best quad bike safari in Africa can be experienced in the Makgadikgadi flat salt pans. Botswana mountain bike safari: the eastern part of Botswana is dominated by mountains which offer great mountain bike safari. Botswana boating safari: you will enjoy great boat cruises in the Chobe, Limpopo and Okavango areas. 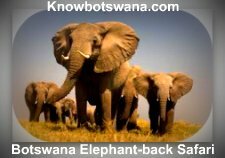 Botswana self-drive safari: exist in all tourist spots in Botswana, but be careful not to engage tour operators who operate unlicensed operations. Botswana balloon safari: enjoy a comfortable ride in a hot-air balloon steered noiselessly over great areas. There are areas in Botswana that stand out as the best regions to have a great safari experience. Safari in Chobe: a safari in Chobe provides for a bigger opportunity to also visit the Victoria Falls and the Zambezi River. The Chobe is renowned for its high concentration of game. Safari in Okavango Delta: the place provides a wide range of experiences from hunting to fishing and camping in some of the privately laid camps in the lagoons. Safari in the Kalahari Desert: enjoy great safari in the desert as well as in the largest game reserve in Africa, the CKGR. Safari in Makgadikgadi Pans: made up of two major basins which are relics of an old lake, the pans are the best place for quad bikes safari experiences. Botswana elephant-back safari: these are popular in the Chobe and Okavango Delta areas where you enjoy uninterrupted game viewing from an elephant's back. Botswana bird watching safari: Botswana is undoubtedly your birding heaven. The best bird watching experience is in the Okavango Delta between September and March. Botswana lion safari: the lion is a grassland animal. Tall grasses exist in the Kalahari, Okavango and Chobe areas where you can enjoy viewing lions especially when they make a sweeping tactical killing. Botswana horse-back safari: found in the Tuli and Okavango areas where horses help you cover a wider terrain and gets you closer to game. Botswana is a popular hunting safari destination which offers trophy hunting and great adventure. Hunting in the Okavango includes fishing safaris in the lagoons. In the Botswana luxury camping safaris tour operators will set up your camp and offer you catering service. Camping is at the heart of great safari tours in Botswana. The budget traveller has almost the equal benefits as those enjoyed by high-end travellers. It is important that you identify the right tour operators who can give you the maximum benefit from spending little. There are many more other types of safari tours that exist in Botswana.